We are at an unprecedented time in modern history in which the 'goddess energy' in every woman is waking up and stirring as women collectively choose to reclaim their power from the structures of authority that have ruled for so long. We all feel it welling up, asking for a new way of being in the world. 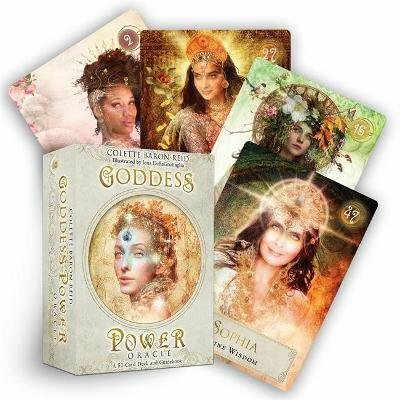 From beloved oracle expert and internationally acclaimed spiritual teacher Colette Baron-Reid, Goddess Power is a unique oracle deck that allows ancient goddesses to revisit us here in modern times, to share their experience, strength, wisdom and truth with the modern spiritual seeker looking for empowerment and guidance. This magnificently illustrated deck features goddesses from ancient civilizations around the world. Once again, 5-STARS! A beautiful deck. The presentation is immaculate. I love these big box sets. Kind of like opening a Christmas present. Once you open the big box, you find the booklet inside and the smaller usual deck sized box inside with the cards. Really digging these. The artwork as usual by Jena DellaGrottaglia just seems to get better and better with each deck she illustrates. I love the gold lettering. The card stock is just something I'm having a hard time with. It's the same card stock that Hay House used with Colette's Mystical Shaman deck and her Spirit Animal Oracle deck. It feels fragile in some way. As if it can damage easily when shuffling too hard. I'm not going to deduct any stars from this. It's just something I'm pointing out. I preferred the stronger Wisdom oracle deck card stock above these. These cards are simply too beautiful to damage them. Other than that, the size of the cards are perfect. I don't mind it when cards are too big. If the deck is too thick for me to shuffle or the cards too large, I just break the deck in three or four which immediately makes it easier to shuffle. In the description I wrote this deck is authentic...by which I meant, you feel the energy coming through these cards, through these Goddesses. Their essence. I have only had accurate readings. I've been doing readings with various decks for the past 10 years. These cards are super accurate and real. On the day upon receiving my deck, I opened it, cleared the energy, locked my energy in etc. That night, Goddess Freye actually came to me in a dream and was all like... "Girl, you need to wake up...we need to talk!" That's how freakin real and accurate and stunning these energies and cards are!